The train is the image of Locomotive #5 of the Nevada County Narrow Gauge Railroad. This was a railroad that ran between Nevada City, Grass Valley and Colfax California from the late 1800's until the early years of WWII. These cities were mining and lumber towns in the west foothills of the Sierra Nevadas in California, about an hour east of Sacramento. I spent my childhood summers there with my cousin and as an adult I lived there for a number of years. 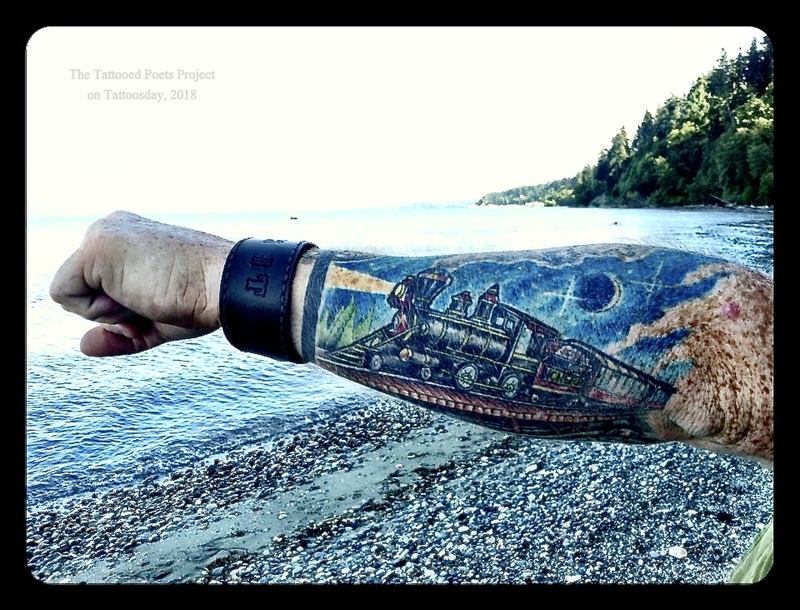 Always a fan of trains since I was a kid, I loved learning the history of the NCNGRR and I thought this tattoo would be a great representation of my passion for trains while paying tribute to the history of a place I lived. The tattoo was done by Cory Norris (@corynorrisart) of Classic Tattoo, which is also in Grass Valley, Ca. watching the train roll to a stop. of desert plains and rocky grades. "Well son, hop on board." Matt Amott is a poet, musician and photographer who rambles around the Pacific Northwest. He is co-founder and co-editor of Six Ft. Swells Poetry Press and has been published in numerous collections as well as two books of his own, THE COAST IS CLEAR (Six Ft. Swells Press) and GET WELL SOON (Epic Rites Press). Matt's turn-ons included pre-1978 custom Dodge vans, OP/Lightning Bolt apparel, shirts with numbers, cords, heavy fuzz, deep Blues, heart-wrenching Soul, record players, CB radios, postcards, Kung Fu movies, Logan's Run, patches/iron-ons and longboards. He can be reached and purchases made at afterhourspoetry.com. Thanks to Matt for contributing to the Tattooed Poets Project on Tattoosday!